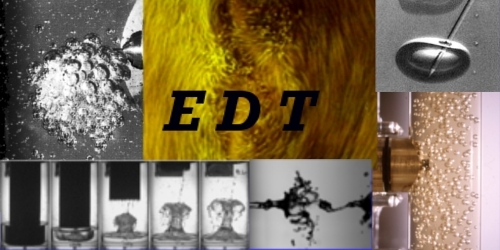 The team EDT (Two-Phase Flows and Turbulences) focuses primarily on model systems (including a limited number of control parameters) in particular with the study of statistical properties of the developed homogeneous turbulence, turbulence and parietal flow scattered (link between micro-structure and average behavior). The team develops parallel instruments (optical sensors, acoustic dynamic correlation), the specific analysis tools (monitoring Lagrangian) models and methods of control. The team is invested in various situations involving interfacial instabilities including studies on assisted atomization, the jet production in heavy fog relaxation, surging and control of propellant in the tanks. This research also cover-biomass hydrodynamic coupling in multiphase flow.